Why do we need to rewrite URL? The best thing about rewriting the URL is that it helps in creating static URL. These can be easily indexed by search engines and hence higher search engine rankings can be achieved. Another best part about static URLs is that these are quite user friendly. If you are looking for a cleaner and easily readable URL then you must deploy URL rewriting tool and enjoy its benefits. If you are working as a seo expert or coding expert then this tool can prove to be of great help and you will be able to save lot of time. The first step to follow while using this tool is to enter your website’s name and press submit button. As soon as the submit button is pressed, you will get two types of information. Either it will be related to static URL or dynamic URL. You can use the information as per the requirement. A recent guideline from Google says that you should not use “&id=” as a parameter inside the URL. They have given a strong reason for this non-usage and that is they themselves don’t use such pages while indexing. Hence, if your website’s URL is having this parameter then you must immediately rewrite the URL and make it search engine friendly as well as easy to remember. How our URL Rewriting tool can prove to be helpful for you? One of the main reasons why you should use our URL rewriting tool is because it helps you to get excellent results. Moreover, the results are fast and help you save time. URL rewriting is considered as one of the ultimate ways to improve the usability as well as search friendliness of your website. While designing this tool, we have made sure that every basic point is kept into mind so that you can operate this tool in a flawless manner. 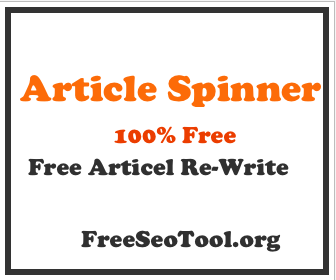 Though there are several URL rewriting guides and tools that can found across the internet but the information provided by FreeSeoTool is genuine and relevant. Apart from URL rewriting tool, you can use many more SEO tools on our website and also gain valuable information about various SEO techniques through our blog section. We have always made sure that we provide free access to these lovely SEO tools and you are able to enjoy a smooth and easy search engine optimization campaign. Working with dynamic URLs can prove to be quite confusing and hence static URLs are deployed for better and easier understanding. Another benefit of URL rewriting is that it is considered as SEO friendly and the rapid development of websites or applications happen. Another major benefit of this procedure is that you are able to enjoy a secure environment because of the robust structure of the application. Hence, if you are looking to create hacker prone URLs then consider using this lovely tool called as URL rewriting tool. This URL Rewriting Tool will help you turn your long dynamic URL into a shorter and static one. Static URLs are better than dynamic ones as they are easier to remember for end-users. They are easier to bookmark. Also, they perform better for search engine ranking purposes. 1. Static URLs typically Rank better in Search Engines. 2. Search Engines are known to index the content of dynamic pages a lot slower compared to static pages. 3. Static URLs are always more friendlier looking to the End Users. This tool helps you convert dynamic URLs into static looking html URLs. You would need to create a file called ".htaccess" and paste the code generated into it, Once you have created the .htacess file simply copy it into your web directory. URL rewriting of this type would work ONLY if you are hosted on a Linux Server.